Early this month, Chef Michael Smith in his post titled Craft + Cocktail + Cuisine shared some turkey recipes that were entries for an employee event he hosted “Not Your Typical Turkey Contest”. My favorite recipe was the “Wild Turkey, Wild Turkey” made with a Wild Turkey Bourbon Glaze. Whoa! Imagine Thanksgiving hosts getting glazed making the turkey glaze. • Love Brussels Sprouts? 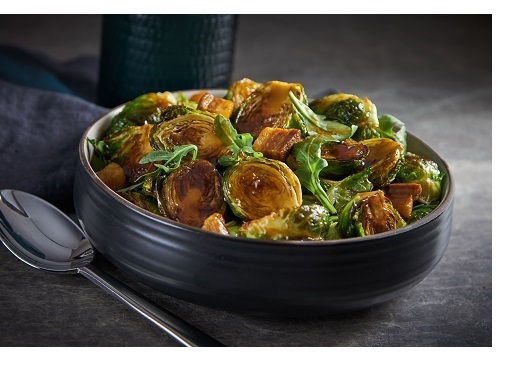 You'll love our new recipe for Brussels Sprouts with Balsamic Gravy! This recipes features our PanRoast® Americana Style Au Jus Mix. • Move over string bean casserole. We are going to serve an innovate Pale Ale Mac & Cheese with Bacon and Pretzel Topping. Another recipe we were considering was our Chefs’ World Traveler Mac & Cheese made with three type of cheeses – cheddar, blue cheese and Monterey Jack. Sounds cheesy good? Oh yes, I forgot to mention. My wife is not going to make a Wild Turkey Bourbon Glaze, but we are going to baste our bird with a Beer Brine with Chipotle Honey Lacquer created by Laura Chute, VP of National Accounts, that she submitted and received recognition in our internal “Share a Recipe” contest. From the Culinary Team at Custom Culinary®. Happy Thanksgiving!